You are about to hire the best home inspection company in the area. We are professionally trained, state licensed, and nationally certified to complete the home inspection task at hand. 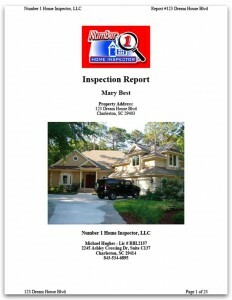 You will be presented a state of the art comprehensive computerized home inspection report with color digital photos. Also, you will receive many other materials that you will enjoy and will assist you in the home buying process and future maintenance of the property. Most of your home inspection will be maintenance recommendations and minor imperfections, however sometimes major defects will be discovered. An example of a major defect would be a structural failure or something that can lead to major defects, such as a small roof-flashing leak. Major defects are things that may hinder your ability to finance, legally occupy, or insure the home. Safety hazards, such as an exposed, live buss bar at the electric panel or any safety hazard should be addressed. Often a serious problem can be corrected inexpensively to protect both life and property. Most sellers are honest and are often surprised to learn of major defects uncovered during a home inspection. If you are in the market for a home inspection or if you would like to know more, please contact us for a personal consultation, or schedule a home inspection today. Number 1 Home Inspector © 2019 All rights reserved.